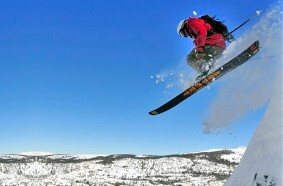 Kirkwood ski resort is on its way to becoming one of the top year-round resorts in the nation. Its 2,300 skiable acres of diverse terrain are filled with gentle slopes, open bowls and hair raising cornices and cliffs, making for an adventure at every turn. Perched atop the Sierra Crest, it has the deepest annual snowfall of all Lake Tahoe resorts, plus the highest base elevation at 7,800 feet. These conditions make for the lightest and driest powder in the region. It is no wonder that visitors flock to Kirkwood every season for a chance to experience this amazing resort for themselves. Ski Kirkwood from the summit at an elevation of 9,802 feet! There are 15 lifts and 72+ runs for skiers and snowboards. Kirkwood’s four dynamic terrain parks range from an easy beginner park with rollers, spines and whoop-de-doos, to an expert level park with big jumps and kinked rails that will get your blood pumping. There is also an X Course for skiers and snowboarders to race a friend and test their speed skills. This winter paradise also offers opportunities for cross country skiing and snowshoeing, sled dog tours, back country expeditions, and snow cat tours. Families will love the Thunder Mountain Kid’s Snowmobile Park and Slide Mountain Tube Hill. Soar up to 75 feet above the ground on Lake Tahoe’s first canopy zipline tour with eight different ziplines and three sky bridges. Best of all, it is open year round! In the winter, guests can hop on a chairlift to access the zipline, while in the summer guests are driven to the course in passenger ATVs. The summer season reveals a whole different side to Kirkwood, with world-class rock climbing, gorgeous hikes, thrilling Mountain Bike Park, and Ropes Challenge Course. There is also a disc golf course, horseback riding, and fly fishing opportunities. Ski Magazine ranked the resort number 10 in the country in its October 2009 edition, and it was chosen as Resort of Choice for Winter 2008 by readers of The Wave Magazine. Kirkwood, CA, is located 35 miles southwest of South Lake Tahoe and 177 miles from the Bay Area in California. Plan your stay with the help of Kirkwood web cams, which provide real time views of mountain conditions in the unpredictable winter months. This is truly an experience you will not want to miss out on. Review our Lake Tahoe ski resorts map and plan your ultimate winter vacation and ski the slopes of as many Lake Tahoe ski resorts as possible.